UNEANS in Silver Harmony is presented by Uno High School Alumni Association, Inc. featuring the incredible musical group The CompanY who is also celebrating their 30 years in the music industry. 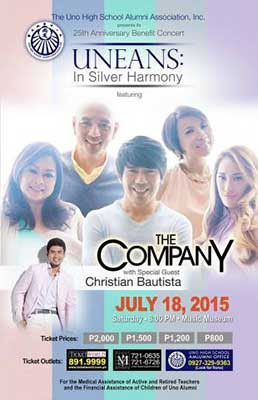 Christian Bautista is also set to perform as the special guest. A good reason to go to this concert is that it aims to raise funds to benefit the Unean Educational Assistance Program that helps the children of the alumni and for medical and financial assistance for past and current teachers of Uno High School. For tickets call Music Museum at (63 2) 721-0635, (63 2) 721-6726, Ticketworld at (63 2) 891-9999 or Uno High School AlumniOffice (63 927) 329-9363.